Daphne is a true gem and she passed her talents and beauty on to her offspring. 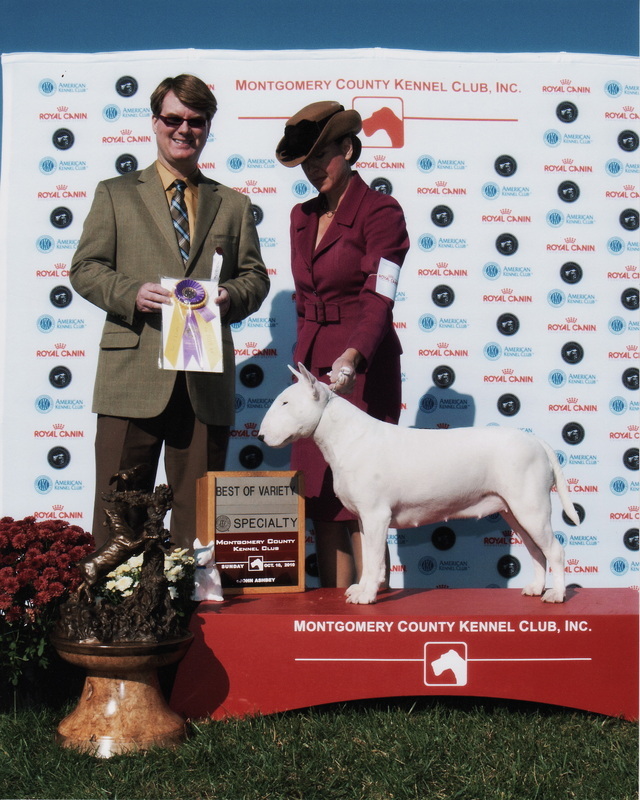 She produced three ROM champions and her daughter, Saki was both the number one White Bull Terrier in 2015 and is the first Bull Terrier ever to earn the AKC Tracking Dog Title. To say Daphne's cuddly is an understatement. One of her nicknames is "T-bone" because she can't cuddle close enough to us at night and it seems like she's trying to pile drive into our sides. Really, this video of her in the cozy cave is everything you need to know about Daphne. She really is that sweet and cuddly. Daphne's retired from the show ring and whelping box and very much enjoying her agility and rally career. Her daughters and granddaughters are following in her footsteps in the show ring and whelping box. Daphne was co bred with June and Irv Krukenkamp, MD (TNG).